Hungarian designers, investors and contractors visited a retaining wall site where was used Maccaferri’s MacRes solution. On April 6th through 7th Maccaferri Central Europe organized a job site visit for Hungarian designers, investors and contractors. 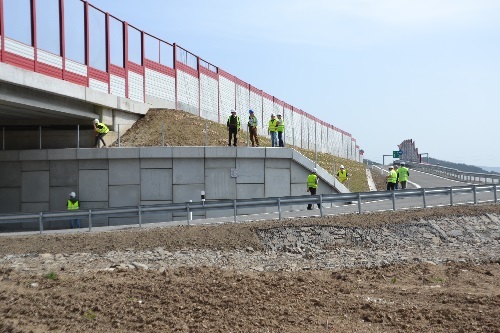 The two day visit enabled attendees to visit various different project sites—some still in progress and other already completed—for which Maccaferri Central Europe has been contracted for. As part of outreach presentations, participants were asked to familiarize themselves with technical solutions, reinforced slopes, retaining walls, bridge abutments and wings. One project site visited by participants during the tour was the D1 DUBNÁ SKALA-TURANY, SO 243-00 Retaining Wall site. The project was chosen by the organizers of the job site visit for its exemplary use of MacRes. To elaborate further, the retaining wall 243-00 is located in the Martin town district. The motorway is situated in the crest slope of the foothill with steep terrain in the cross section. There is a cut on the right side of the motorway and embankment on the left side. The purpose of the proposed reinforced wall is to form and retain the high embankment. Participants were able to note the following solution: the installed retaining wall 243-00 is formed by system MacRes— reinforced soil structure with precast concrete facing panels reinforced with polymer geostrips. The wall has 3-stages (2 berms), an inclination of 90°, with the embankment situated on top. The maximum wall height at the site is 18.00 m. The jobsite exemplifies how reinforced soil wall can be formed using precast concrete facing panels of standard size 1,5 x 1,5 m and a Paraweb reinforcement—high adhesion polymeric geo strips (GST). Moreover, the panel aspect ratio, combined with compressible bearing devices gave participants a thorough understanding of good system articulation, thus enabling significant tolerance to longitudinal differential settlement, especially in a circumstance where the panel aspect ratio was near unity.